Every woman deserves a gorgeous timepiece to adorn her lovely wrist with; we give you a collection of elegant watches online to choose from. 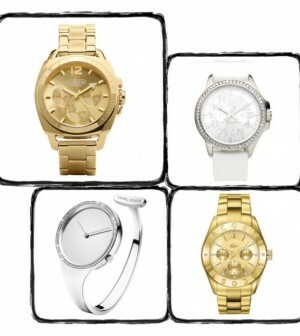 From gold plated to white to silver, you will fall in love with these feminine online watches. Choose one or all of them, and add these luxury beauties to your personal watch collection today. Top right is the Juicy Couture silver jetsetter with sparkling Swarovski crystal bezel and a JC monogram accent crisp silver metallic tonal dials. A white silicon jelly strap adds a young bit of fun. It’s a pretty style piece that is worn best with casual outfits, day or night. Top left, we feature one of our favorite watches online by Coach. This boyfriend style makes an elegant statement and keeps flawless time. Like all Coach watches online, it was crafted by one of the world’s best watchmakers for accuracy, durability, and water resistance to a minimum of 99feet. Bottom right is another gold plated luxury beauty by Lacoste. It’s a simple and elegant timepiece of all watches online, and offers calendar functionality in a brilliant stainless steel gold tone. The final piece in this elegant watches online collection is a style stunner by Georg Jensen. Created by the legendary Swedish designer Vivianna Torun Bülow-Hübe as a reaction to the relentlessness of time, the numberless diamond bangle watch was originally designed as an ornament rather than a chronometer. With a design language evocative of independence and strength, the open-ended bracelet design – not completely encircling the wrist – highlights the liberation from time, “I wanted to free people from the slavery of time. 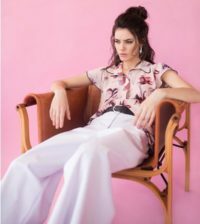 I wanted to make a watch that reminds you that life is here and now, so I created a watch with a mirror face and no numbers,” said Bülow-Hübe of her design. The elegant universality of Vivianna has captured the hearts of women across the globe, earning the timepiece the status as an international design icon. And no surprise it earned its way into our elegant watches online must have collection for women.